"The faster it is, the better I like it!" Profile: Quickmix was a crabby, absent-minded professor at the Computechnic Institute of Microprocessor Engineering on Cybertron at the time Autobot-Decepticon hostilities began millions of years ago. His specialty was developing new materials that possessed enhanced energy-transmitting properties, a technology that, in the wrong hands, could be applied to improving weaponry. Although he wanted no part of the war, after repeated raids on his laboratory by a band of Decepticon bandits, Quickmix felt compelled to join the Autobots. But first, as going away present of sorts, he rigged his lab to blow up the next time it was broken into. Shortly thereafter, he returned. Amid the rubble of the devastated lab, Quickmix couldn't find enough pieces left of the Decepticon bandits to make into a charm bracelet. He achieved instant popularity among his new Autobot comrades. Now they know him as much for his impatience and short temper as for his brilliant inventions. He's constantly devising new formulas and gadgets to use against the Decepticons. In fact, he's so busy beginning new projects that he rarely sees old ones through to completion. Quickmix is teamed with the Nebulans Ricochet and Boomer. On Nebulos, the mercurial Ricochet was a renowned environmental sculptor, combining landscapes and foliage to create natural art forms. After witnessing the Decepticons' trampling some of his more famous sculptures, he joined the Autobots. As is the case with so many artists, Ricochet responds poorly to criticism in any form. Boomer is Ricochet's virtual opposite in personality. He is warm, friendly, generous - a pleasure to be around. He never has an unkind word for anyone, even the Decepticons. As head of the Consumer Complaint Agency on Nebulos, he learned to not take offense at anything. He concluded that if he could successfully deal with thousands of angry citizens, deterring a few dozen deranged Decepticons from conquering his world should be easy for him. And so he joined the Autobots. Abilities: Quickmix transforms to a ground vehicle with the outward appearance of an Earthen cement mixer truck. But in reality, his mixer tank contains a sophisticated system of sensors, gauges and catalytic agents, which allow him to create a virtually endless variety of chemical compounds and metal alloys. He applies many of these results to improving Autobot armor and weaponry. As a truck he has a maximum speed of 150 mph and a range of 450 miles. Ricochet is bio-engineered to convert to an automatic sub-machine gun that shoots metal-piercing, titanium-tipped bullets. Boomer is bio-engineered to convert to a ground-shaking, steel-shattering sonic pulse cannon, which sends out discrete waves of concentrated sonic energy. 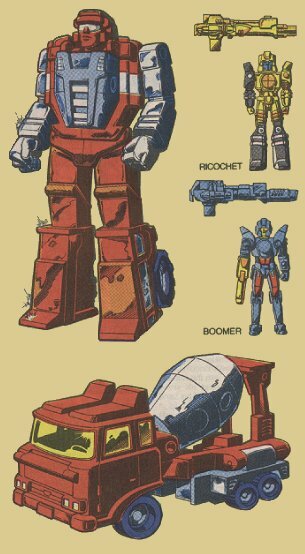 Ricochet and Boomer can also combine to form one weapon, which retains the capabilities of both components. Abilities: To operate properly and efficiently, Quickmix's mixing tank must constantly rotate. However, the tank often gets stuck. On those occasions when it contains volatile chemicals that are allowed to settle for too long, the tank... and Quickmix... can be seriously damaged.